Carolyn Porter | July 18, 1944: "I still have a little supply [of food] for snacking." 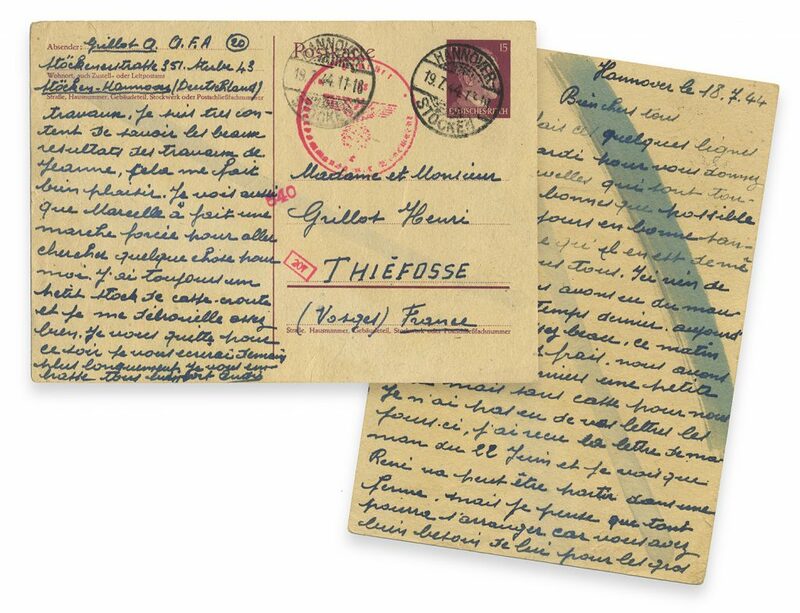 Click here to see/read a postcard written by WWII French forced laborer A. Grillot on July 19, 1944 and mailed from Hannover, Germany. I’m sending these few lines to you this evening, Tuesday, to give you my news, which is still as good as possible. 1. The card was addressed to “Mr. and Mrs. Henri Grillot, Thiéfosse, Vosges, France.” Thiéfosse was a very small town, where a street address was not needed. Census records between 1836–2015 show a population between 568 and 790 at various times. It is still a very small town! 2. The Vosges Mountains are near Germany. This part of France was claimed by the Germans after the Franco-Prussian War in 1870–71, then returned to France after WWI, then became part of Occupied France, and again became French after WWII. 3. You can see the different shades of ink, probably indicating that the writer dipped his pen into ink after every 4 words or so, maybe until the ink started flowing more smoothly. 4. You can see the Nazi highcommand stamp, faintly. 5. There is no stamp showing how long it took for the card to arrive.